If you have composed music for your wedding/first dance or are a music composer with music that would be used for weddings, processional and first dances, please contact Wendy at wowproductions2@earthlink.net. Send a link to your music, the words and how people can order and contact information. CLICK ON THE COMPOSER'S PHOTO OR NAME for Information & to listen to their original songs. Kathy Bee wrote and produced a musical and musical showcase about the homeless called “The Tin Can”. Kathy Bee is also "The Red Hat Mamma" who often entertains for her fellow Red Hat Sistersat conventions, festivals and celebrations. "You and Me and Love" was written as a first dance, and it is suitable for both Weddings and Anniversaries. 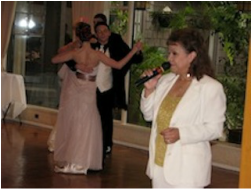 Enjoy it at your reception as a first dance or as prelude music during the ceremony. Available in 4 variations: Male Vocal, Female Vocal, Instrumental or in Spanish with Male Vocal - Tu, El Amor, Y Yo. When you purchase this song you will also receive a royalty-free, non-commercial sync/mechanical license for one time personal use in your video and wedding webpage. Click on the title or photo to take you to Bruce Garnitz page and song. Jim "Kimo" West is one of ki ho ‘alu’s most unique talents. A virtuosic player and prolific composer, his delicate, heartfelt playing technique and his generous output of new, exciting slack key guitar originals puts him solidly in a category of his own. Enjoy some beautiful choices of original slack key guitar Hawaiian wedding music by Jim "Kimo" West. Original music written by Jaime (Zinger) & Elan Borenstein on the occasion of their wedding. Neither of them had ever written or recorded a song before - but they did it as a surprise to their family and friends as well as finding the perfect wedding favor. Click on the title or photo to take you to their page, video, song and their heart warming story that could bring a tear to your eyes.